I challenge any objective person to look at these two clips of Tulsi speaking to and interacting with Muslims and claim that she doesn’t have Aloha (love and respect) for Muslims or anyone else for that matter. Tulsi interacting with young Muslim women in Syria. When asked about the Ozy claim, Gabbard said she was referring to abortion, not marriage equality. 3. She voted in favor of the Iran deal, but the author conveniently forgets to mention this. In Oct 2017, she spoke on the House floor and wrote on op-ed in support of upholding the Iran nuclear deal. This [US led regime change] war has already cost hundreds of thousands of lives and forced millions of refugees to flee their homes in search of safety for themselves and their families. It has also strengthened al-Qaeda and other violent, extremist groups in the region. 5. Regarding Sheldon Adelson: The anti-online gambling bill that she introduced and that is backed by Adelson is supported by Hawaii’s attorney general. I’m sure that had absolutely nothing to do with Hawaii’s representative sponsoring it! Her co-sponsor is from Utah, whose AG also supports the bill. She has also received no contributions from Adelson and has opposed Adelson’s call for US deposing Assad vehemently and repeatedly, even introducing legislation to stop it. 6. She thinks we should acknowledge the threat of the exclusivist ideology held by the Wahabbi Salafist interpretation of Islam, that has hurt Muslims more than anyone else. Note how the author tries to conflate this with Islam as a whole, then projects this onto Gabbard. That is not her position. She in fact accepts Prophet Mohammed as a messenger of God, as she stated in her keynote at the 10th Annual Prophet Muhammad Day event. 7. 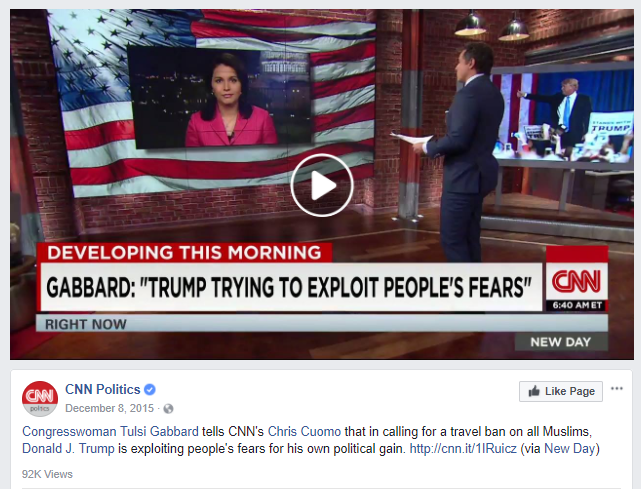 This statement is incorrect: “Gabbard’s insistence that economic factors play no role in fostering extremism” — actually what she has said is that the ideology motivating ISIS/Al-Queda etc leaders is Wahhabi Salafi interpretation of Islam and to destroy these groups we need to counter this ideology and she repeated this message at her keynote at the 10th Annual Prophet Muhammad Day event. It doesn’t imply other factors are not at play. 9. Bannon is apparently a fan of Bernie Sanders and Elizabeth Warren as well. So what? Tulsi co-sponsored a bill that would have had the the effect of removing Bannon from the NSC. KKK grand wizard David Duke has endorsed Keith Ellison. So? It would be a double disaster if someone who came to America as a refugee ended up engaging in a terrorist act. First, it would cost the lives of innocent Americans. Second, it could lead to the complete shutdown of our refugee program for a long, long time. This would be extremely unfortunate. I want to make sure that doesn’t happen. It’s important for anyone who really cares about keeping our refugee programs open to seriously consider the negative impact to such programs if a terrorist attack occurred and a refugee were involved. This happened before, in 2009, when two al-Qaeda terrorists came to the U.S. as refugees from Iraq, and were actively supporting al-Qaeda from the U.S. while also plotting an attack on U.S. soil. Following their discovery and arrest, the refugee program for Iraqis was completely shut down for six months. “As I look out among you tonight, I am reminded of the desperate need for unity and celebration of our diversity, that all of you are a living example of it, and the rest of the country and the world … could learn many lessons just by standing here and celebrating it with you tonight,” she said. 13. Obama’s close relationship with Modi to promote US-India ties has been labeled a bromance by the CNN, so why single out Tulsi for doing the same? And, as a member of those committees, it’s Tulsi’s responsibility to meet and have talks with world leaders and she had met with Prime Minister Abe in Japan, ex-President Park in the Republic of Korea, and China’s Premier Li Keqiang in Beijing, President and Prime Minister of the Kurdish Regional Government, the Prime Minister of Iraq, Prime Minister Netanyahu in Israel, King Abdullah in Jordan etc. She has in fact met and has warm relations with prominent critics of PM Modi like Shashi Tharoor and Rajeev Gowda as part of her diplomatic duties. The resolution, introduced in Nov 2013, praised the U.S. State Department’s 2005 decision to deny Modi a visa (a ban originally pushed through by right wing US and Indian evangelicals) because of his alleged “egregious religious freedom violations”. This is despite the fact that in 2012, India’s Supreme Court-appointed special investigation team probe found no “prosecutable evidence” against Modi for those allegations. Fareed Zakaria, an Indian American Muslim, called the ban “selective, arbitrary and excessive.” As Zakaria wrote, Modi had been cleared by several investigative bodies in India for any culpability in the Gujarat riots, and continuing the ban was not only against the crucial U.S. and India relationship, it was wrong. HR417 was opposed by other stalwart supporters of better treatment of religious minorities like Mike Honda (who also signed a letter to invite Modi to address the US congress in 2014) and Ed Royce. The top Democrat on the Subcommittee on Asia and the Pacific Eni Faleomavega, made no secret of his view that the resolution was aimed at Modi and said the US was wrong in pursuing such a policy. Tulsi opposed the timing of the hearing for HR417 saying it sought to influence the outcome of India’s national elections, since the resolution targeted Modi, who was running in the elections to be held a month later. Tulsi’s resolution “Calling on the Government of Bangladesh to protect the human rights of all its citizens, particularly vulnerable minorities, strengthen democratic institutions and rule of law, and prevent the growth of extremist groups”, doesn’t target any person and has been endorsed by secular organizations, like Centre for Enquiry, American Humanist Association, Secular Coalition of America, and Mukto-mona. “I do not believe the timing of this hearing is a coincidence. The national elections in India begin on Monday and continue until May 12. I am concerned that the goal of this hearing is to influence the outcome of India’s national elections, which is not an appropriate role for the US Congress. Such interference with India’s elections would undermine our shared goals. The United States of America should always stand for religious freedom for all people in all countries and should always work to that end. In this regard, we need to be especially careful not to directly or indirectly contribute to sectarian strife in India or other countries. I am concerned that this hearing is an attempt to foment fear and loathing purely for political purposes, and that it’s being done to influence India’s national elections. This is wrong and it will contribute to further sectarian division in India and will undermine the national interests of the United States. opposed bigotry against Muslims by Trump, Carson, Graham (on Fox news) & others and has been called a “refreshingly strong voice for secularism and free expression” by secular organizations. She has also opposed Trump’s Muslim ban and refugee ban. She also condemned violence, bigotry, and hateful rhetoric towards Muslims in the United States by cosponsoring H.Res.569. Gabbard has shown utmost concern and respect for our community, the Syrian people and for all new Americans, which is why so many Syrians at home and in the U.S. support her tireless efforts to bring peace to Syria.